Our message this week from Mark 6 and John 6 tells the story of Jesus feeding the multitudes. They were so impressed with his powers to fill their tummies, they wanted to make Jesus King! 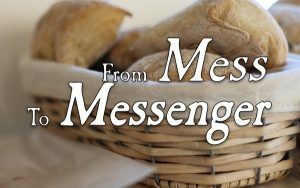 But Jesus wants to feed our spirits so we can be sent as messengers of the Mess-iah. We will learn that Jesus takes our messes and turns us into messengers of hope and healing. God’s spiritual energy is accessible to everyone at Cold Spring Presbyterian Church. Get more out of your life, and gain resources to help you put more into your life! If you were King of the Universe, how would you feed the world? Italian bread? French bread? How about a cinnamon raisin bagel? Or Pita? 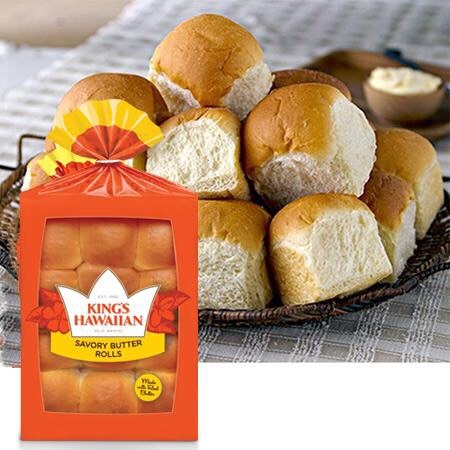 Well, if you were King, maybe King’s Hawaiian? Jesus meets our needs, and wants us to help meet the needs of other’s too. 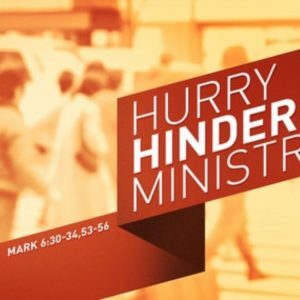 2018-07-22 Message- Hurrying Hinders Ministry. Whoever Touched Him Became Well. Guided meditation to prepare you for what’s next! A Message from transformation pastor, Rev. Dr. Kevin Yoho from Mark 6:14-29. “If you sow to the Spirit, you will reap eternal life from the Spirit. So let us not grow weary in doing what is right, for we will reap at harvest time, if we do not give up. So then, whenever we have an opportunity, let us work for the good of all, and especially for those of the family of faith” (Gal. 6:8b-10, NRSV). 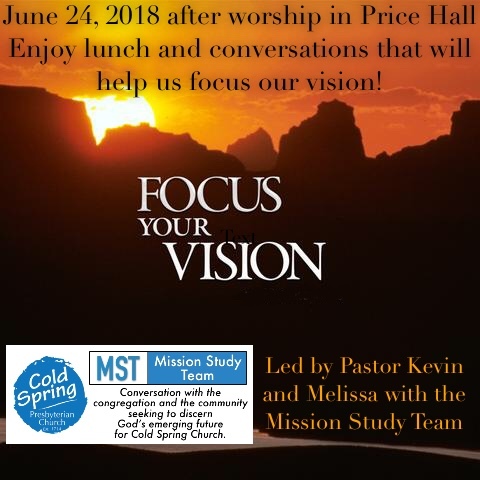 On June 24, about sixty people participated in our Focus Your Vision Day in Price Hall that included worship, luncheon, and conversations about the future. It was an engaging and energizing milestone on our transformation journey. A summary of our focused vision includes: 1) Hold on to the best of the past, 2) Explore the new, 3) Plant spiritual seeds, 4) Serve everyone in the community, 5) Grow the ministry. The session will be leading us in th next view months as we put this vision into action. We are grateful to everyone who participated, offered comments, shared ideas, concerns, and hopes, and affirmed their visions for the future. We expressed thanks to the Mission Study Team, especially to Lenore Bowne for organizing the delicious luncheon and making Price Hall welcoming for everyone, including many first-time and returning visitors and guests. 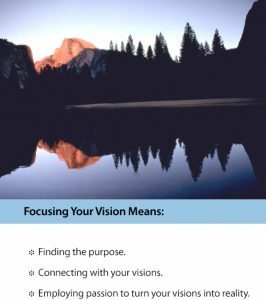 Focusing our vision is not just a one day event. Every day we listen to God’s Spirit who is showing us where and how to become more engaged with our community through worship, witness, mission, and service. Our leadership team (Session), caring team (Deacons) and our many groups and committees will ensure that Cold Spring Presbyterian Church continues to learn and grow as we follow Jesus Christ. 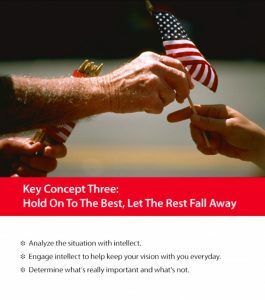 Keeping the best of what we have was one of the seven key insights from the video. Blessings from God include tangible assets (people, location, property, buildings, and finances) and intangible assets such as our history, relationships, experiences, passions, hopes, talents, abilities, and our mental, physical, and spiritual gifts. 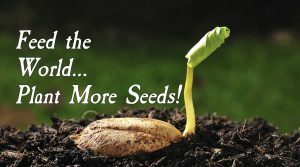 On June 17, the message Feed the World, Plant More Seeds considered the mustard seed. 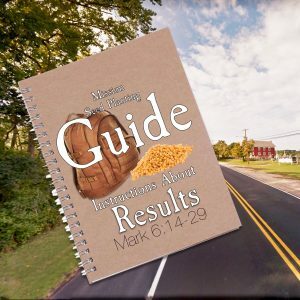 (Listen to the message by clicking here.) Though it is the smallest of seeds, it will grow into an incredibly large tree. The same is true of our faith. While we may think our faith is small compared to others, it is enough and it can grow. We are in the seed planting business. Not only in our ministry as a Farming Church, planting seeds and sharing the produce with the community at large, but we are planting spiritual seeds, as well. Whatever amount of faith you have, it is sufficient for God to bless and use us in amazing ways! But we don’t want to merely consume the spiritual fruit for ourselves. If we consume all our fruit, we not only will become overfed, but others are left hungry! We want God to produce fruit in abundance to feed us to feed others! So, how can we nurture our community of faith to have spiritual fruit to generously share with the community at large? One way is to accept the 30-Day Challenge. The 30-Day Challenge I am passing on to you a gift given to me years ago by my mentor, the Rev. Chuck Reinhold, a Presbyterian minister and regional director for Young Life when I was on staff with that national youth ministry. Like any gift, this gift comes free and is useless unless you use it. As Chuck said, this gift is also very expensive and actually cost Jesus Christ his life, which was his mission and his joy (Heb. 12:12). He died on the cross for our sins in order to bring us to God (John 3:16, John 1:12, 1 John 5:11–12). This gift comes alive to us when we accept the challenge every day. We can know a lot about religion. We can recount historical facts about faith, the Bible, and might be able to tell wonderful stories about Cold Spring Presbyterian Church, but this gift is not to know more about Jesus Christ, it is to grow in our relationship with Jesus Christ. The gift is received when we accept this Challenge: decide to meet with God every day for thirty straight days by reading a portion of Scripture and asking the Lord for something specific to apply that day. That’s it! If we miss a day, then we start the thirty-days over again until we read and apply what we read for thirty straight days. If you already set aside time to read Scripture daily, make sure that you actively try to internalize and apply it to your day. The 30-Day Challenge should be challenging! And practical. When we do this, chances are we’ll never quit, and the spiritual seeds planted in our life will continue to grow. What’s more, this gift becomes a gift to others through you! As you read a portion of Scripture ask yourself, “What does God want me to be, feel, or do today?” Then as you pray, write out a sentence about what you discovered so you will remember to put it into practice. Repeat daily. As we gathered around the Lord’s Table July 1, we recalled John 15:5 when Jesus said, “I am the vine; you are the branches. 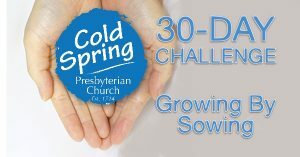 If you remain in me and I in you, you will bear much fruit; apart from me you can do nothing.” We are in the seed planting business at Cold Spring Presbyterian Church. Growing is what we do. Imagine the possibilities if each of us in our own way commit to the 30-Day Challenge. Remember, if you miss a day, there is no failure or judgement. Just renew your commitment the next day! To bring our focused vision to life we need nourishment to grow. Let’s plant spiritual seeds. Let’s share God’s abundance and grace with others. It sounds pretty simple, but many things most treasured in life are just that, simple. So start the 30-Day Challenge today to spend time with God and you will enjoy renewed energy, insight, sensitivity, and love for yourself and others, too. You might want to share your experience, too. As you keep the gift going you will be amazed how your life, our congregation, and community are being transformed! 2018-07-08 Message for Kids- You Are the Seed. You Are the Garden.